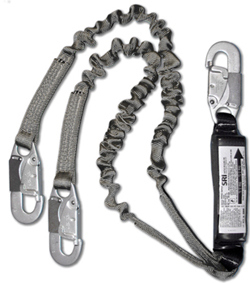 The ProPlus™ 6' Elastic Shock Absorbing Lanyard with standard locking hooks. 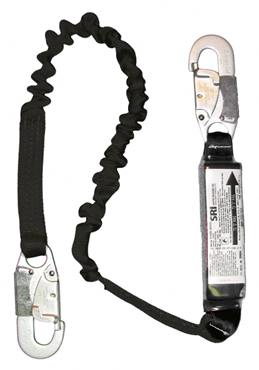 The ProPlus™ 6' Elastic Dual Leg Shock Absorbing Lanyard has web lanyards and standard hooks with 3/4" gate openings on both the technician and work ends. The ProPlus™ 6' Dual Leg Shock Absorbing Lanyard has web lanyards a 2-1/4" gate opening locking hook on both the technician and work ends. The ProPlus™ 6' Elastic Dual Leg Shock Absorbing Lanyard is a single 6' leg shock absorbing web lanyard with a standard 3/4" gate opening locking hook on the technician end and a 2-1/4" gate opening locking hook on the work end. The ProPlus™ 6' Shock Absorbing Lanyard with Oversized Aluminum Carabiner is a 6’ single leg elastic shock absorbing web lanyard with a standard 3/4" gate opening, locking steel hook on the technician end and a 2-1/8” gate opening locking Aluminum Carabiner on the other. 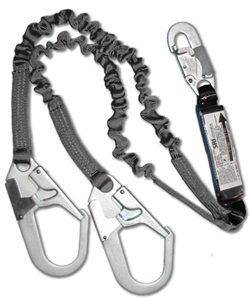 The ProPlus™ 6' Dual Leg Elastic Shock Absorbing Lanyard is a 6’ dual leg elastic shock absorbing web lanyard with a standard 3/4" gate opening, locking steel hook on the technician end and a 2-1/8” gate opening locking Aluminum Carabiners on the other.